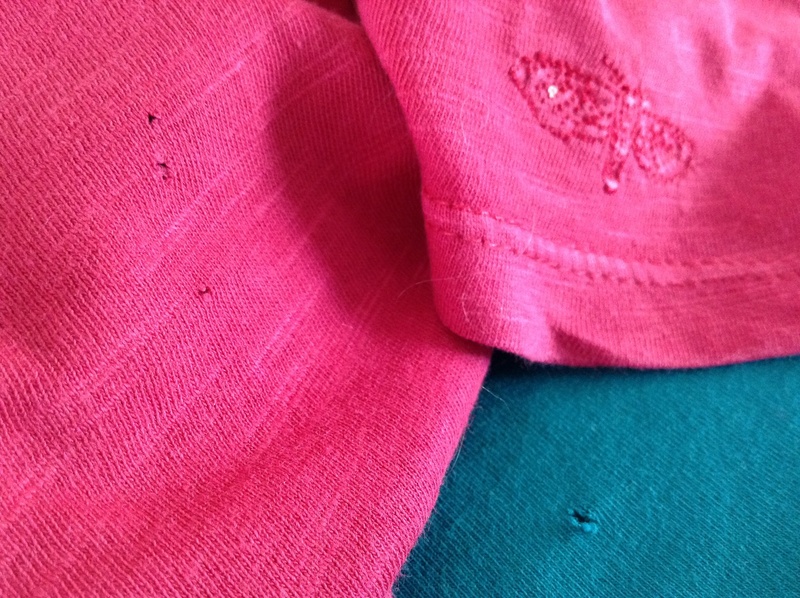 So when I saw holes in several t-shirts recently, I began to panic and immediately looked for signs of moth life in all the likely places. I’m pleased to report (touch wood) that – apart from the holes in my t-shirts – there were no obvious signs of unwanted guests or large-scale destruction. Phew. To be on the safe side, I’ve increased the number of cedar blocks in my stash boxes, and have refreshed the lavender bags in my cupboards. So what caused the holes? With a little detective work, I have now identified the true culprits … my double pointed knitting needles! 😉 The holes are all in the same place, just where I rest my DPNs, particularly when working on sock projects. I’ll be more careful in future! Have you had a lightbulb moment this week? I’d love to hear about it! This entry was posted in Uncategorized and tagged Help, thoughts, tips. Bookmark the permalink.